Furnishing my daughters’ playroom and bedroom is an ongoing project. Some things I’ve bought (a pink changing table springs to mind) haven’t lasted more than a year, others have stayed the distance for the past five years. But an item of furniture like this? I would squeeze my kids onto it until they were teenagers! Boom offers you a range of fabulously stylish modern chairs, sofas and yes, even a corner sofa. 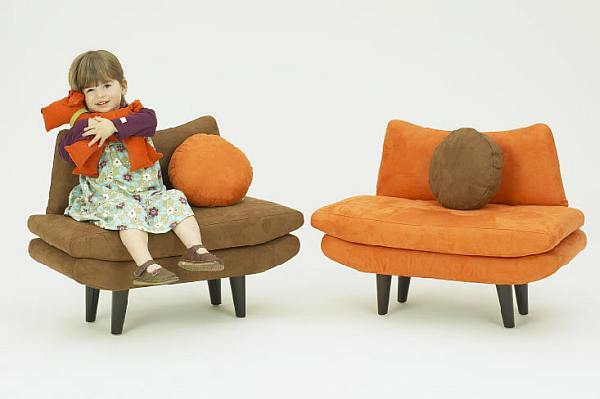 Sturdily built, with chrome legs, each is available in a range of colours from orange to chocolate. With easy to clean covers, they come with the cutest pillows to complete the look. What better place for entertaining at tea parties, reading or generally just lounging around. Of course such splendour doesn’t come cheap. The chair is US$300, the sofa US$350 and the corner sofa US$650 from 2Modern – contact them direct for information on shipping to Australia.